A NOFA ‘Carbon Paper’ Digest a project to translate scientific papers on soil carbon for the general public. Summary: This scientific paper argues that the co-evolution of grass and ruminant grazers over the last 40 million years resulted in organisms capable of sequestering large amounts of atmospheric carbon in grassland soils. When measured in greenhouse gas (GHG) units, their sequestration exceeded GHG emissions (including emissions of methane) caused by these grazers, resulting in net soil carbon gains. Argument: The authors collected data from peer-reviewed studies to compare global GHG emissions from the 3 main agricultural sources: raising domes-tic livestock (primarily ruminants), crop production (including tillage, fertilization, harvest and transport) and soil erosion (from both livestock and crop operations). They also evaluated methods of managing ruminants to increase carbon sequestration in soil. The authors found that, properly managed, ruminant grazing can sequester more GHGs than it emits. Such good management, here referred to as regen-erative adaptive multipaddock (AMP) conservation grazing, uses short periods of grazing in an area before the animals move to new feeding grounds, leaving old areas to experience extended periods of recovery after being grazed. In prehistoric times before conscious human management, such short grazing periods were enforced on large migratory ruminant herds by their desire to avoid heavily fouled grazing sites and to respond to predation, fire, herding and hunting. Today, the AMP rancher constantly and proactively adjusts the grazing period to the amount of forage remaining, calculating the needed recovery period given the season, rainfall and other conditions. When properly managed, this system results in soil microbes rapidly recycling nutrients and enhancing the soil structure to result in increased soil carbon levels. The below figure shows the authors’ calculations of net North American greenhouse gas emissions for 5 agricultural scenarios. 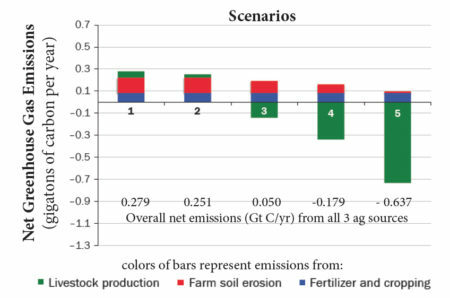 All 5 scenarios assume cur-rent conventional crop production methods and yields, resulting in the annual emission of 0.083 gigatons of carbon (Gt/C — blue component of each bar in graph). The livestock-raising components of each scenario differ, however. Scenario 1 shows current quantities of animals and methods. Scenario 2 cuts animal quantities by 50%, but assumes current production methods. Scenarios 3 through 5 involve current animal quantities, but assume increasing percentages of those animals are raised using AMP grazing: 25% in scenario 3, 50% in scenario 4, and 100% in scenario 5. Thus emissions from soil erosion (red por-tion of each bar) decrease as AMP methods are increasingly used (scenarios 3 to 5). The final component of GHG emissions (green portion of each bar) is those from the livestock themselves. Without AMP grazing, GHG emissions (primarily methane) are positive, although scenario 2 results in half the emis-sions of scenario 1 since livestock numbers are cut by 50%. As AMP grazing is increased (scenarios 3 to 5), however, carbon becomes sequestered in soil and net livestock GHG emissions (green portion of bar) go negative. In scenarios 4 and 5 overall emissions are negative because more greenhouse gases are sequestered than emitted.